More inspiration, that’s what we need! And that’s what we got, after three inspiring weekends of our PDC we got yet more inspiration! 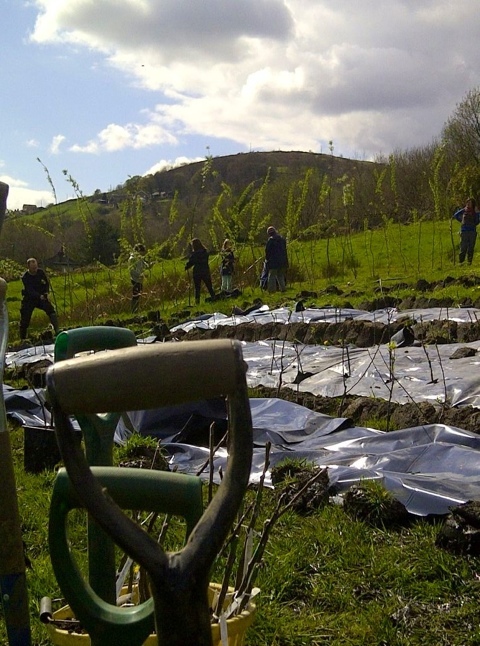 We’ve just had the fourth weekend of our course and it was an exciting two days of visits to projects in West Yorkshire to see Permaculture principles being put into action in different ways. Saturday saw us doing car share and train rides out to Marsden and Slaithwaite near Huddersfield. Our first stop and main visit was to Paddock Farm, the home of Edibles, a co-op run by Rosie, Steve and Pip. Despite the very wet weather we were welcomed warmly into their new, partly finished, classroom. After sharing their story with us we split into groups for a tour of their very wet but inspiring grounds before splitting up into work groups to investigate mulching, plant potatoes, cut back willow fedges, plant new fedges, dig drainage ditches and plant newly grafted fruit trees. The activities and conversation brought so much of the theory we have been discussing to life. Oh, the rhubarb cake is absolutely stunning! A short drive later and we were in Slaithwaite (typical Yorkshire name that is not pronounced the way it looks) to visit the local green grocer Green Valley Grocer. The Green Valley Grocer is a cooperative owned by its customers and supporters. They “aspire to purchase 50% of our produce from local growers or producers within the 30 mile radius and would like to try and achieve this by 2015. We want the locally grown element in this to be 20% (as opposed to locally made)”. Their full strategy can be found on their website – it’s amazing and they are making good progress. Our next stop was at a former “lodger” of the grocers, The Handmade Bakery, a not for profit community supported artisan bakery and cafe. Originally started in the kitchen using an Ikea oven it has now arrived in its own premises after a spell using a Pizza shop oven part time and lodging at the grocer. The bakery has funded its growth by issuing bread bonds (which can only rise!) so they have not had to go to a bank. It’s a brilliant place and well worth visiting, we are now planning our next walk to involve a visit. Do check their website for their opening times. We left the bakers laden down with bread, buns and flour – not all of these reached home as some were consumed fairly quickly – and headed back to Marsden to find the pubs full of sides of Morris dancers, folk singers and visitors. There was a lovely feel of community and “people care, earth care, fair share”, inspiration to take home with us. Sunday saw a slightly later start, a good thing too as we were all pretty tired by now. We started at the Cornerstone Housing Cooperative in Chapeltown, Leeds, fortunately only 10 minutes walk from where I live. Niels, one of the PDC course tutors, lives here and we were able to have a good poke around looking at his plants, nursery, watering system, etc. We then did an exercise to redesign it! A short walk took us to the house of one of the other tutors, Andy. He lives in a Victorian through terrace with a very small front garden and back yard. After a lunch in front of his wood burning stove accompanied by Jack on the piano, Andy talked us through some of the modifications he has made to the house and showed us the planting of his gardens, permaculture principles were woven through everything! A short walk through the community looking for north facing solar panels (!) and we arrived at Tim’s house. We’ve known Tim for many years, he used to be our lodger, but we hadn’t visited him for a while so it was great to catch up with him even if we did have to shelter under our brollies whilst we walked around his garden. Although not a strictly a permaculturalist Tim has been working towards self sufficiency for many years and he is always inspiring to listen to. Finally, all 20+ of us walked up through Chapel Allerton grave yard to our house and we all sat around our second pond discussing permaculture and possible future projects. I was really glad that I didn’t have any work planned for Monday as by this stage my mind was struggling to keep up with everything and it’s taken a week to get as far as the blog! This entry was posted in Economics, Environment, Food, Garden, Lifestyle, Permaculture. Bookmark the permalink. Wonderfully inspiring Paul. But what are fedges, presumably a combination of fences and hedges, a subject for a future blog? Thanks Richard. On our course someone suggested that a fedge was a fruiting hedge but the term is usually used for woven willow hedges or similar. Apparently the word is a cross between fence and hedge and you can read more at the Kingsbarn website. Incidentally, fedge is also apparently a street slang word, I came across it on Google, and refers to a bloke who is quite well endowed! 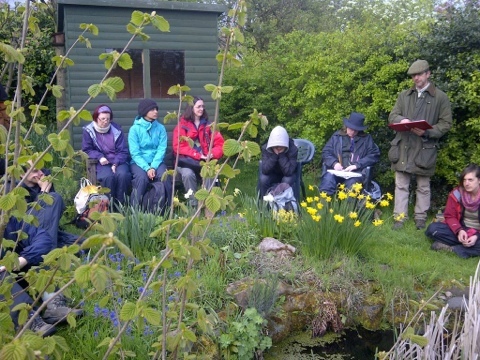 I am looking at doing a pdc course too but have not yet found a weekend one like yours in yorkshire. Could. You tell me who you did your course with please? Probably the best source of info on courses is the Permaculture Association website, particularly it’s education pages. I did my course with Andy Goldring based at Hollybush House in Leeds. 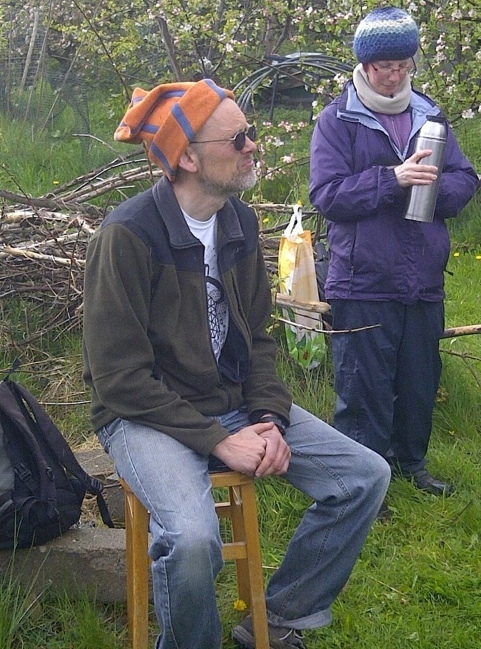 Andy is running a residential course at Edibles between Marsden and Slaithwaite near Huddersfield this summer. There may also be plans for a course based over a series of weekends starting in the Autumn but you will need to contact the PA for any further info. The PDC I did was absolutely brilliant and I can’t recommend it enough!